Today, we explore another iconic monument of Berlin. It’s one of Germany’s national symbols, and for sure you have seen it on multiple posters, prints and postcards: The Siegessäule – the Victory Column. But do you even know which victory it was dedicated to? Probably not, right? So here you go, we got you covered. There is so much to tell about the Siegessäule. Let’s start off by investigating its location and surroundings. Actually the Column’s location is quite an interesting topic in itself, since it originally was built at another place than where you can find it now. Are you curious? You will find out more about this change of location in our talk below. 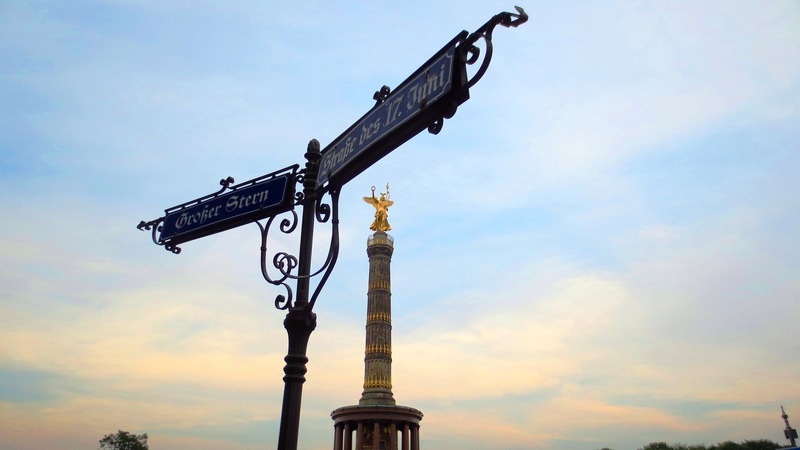 Today, the Victory Column is situated right in the middle of Tiergarten, which is a very scenic and huge urban park in the heart of Berlin. Tiergarten covers the entire area between Brandenburg Gate and Zoological Garden. By the way, it is Germany’s third largest urban park. Number one is Tempelhofer Feld, number two is the Englischer Garten in Munich, and number three is our beloved Tiergarten. Right in the middle of Tiergarten cuts the Strasse des 17. Juni – the Street of 17th of June. The trafficked street is named in memory of the uprising of the people in the GDR on June 17th, 1953, when the masses went on the street to protest against the socialist regime. So the street is interrupted by the Big Star – Großer Stern – a square and intersection right in the middle of the park. And here we finally are: on the Großer Stern you find our stunning Siegessäule. The Siegessäule, or the Victory Column, is a 67 meters tall neoclassical beauty made of sandstone and granite and decorated with a golden victory angel on its top. In Roman mythology, Victoria is the goddess and personification of victory. Okay, so the guys who planned and constructed this monument clearly wanted future generations to remember a victory – which one? Listen to our talk below!